The Banzai Pipeline, one of the most famous surf breaks along Oahu’s Seven Mile Miracle, is known by wave riders the world over. This is no beginners’ break: Pipeline has earned its reputation as one of the most intense on the planet. The danger here is the same thing forms its ridable tubes—an abrupt and shallow coral shelf that causes the water mounds to topple quickly and very close to the shoreline. 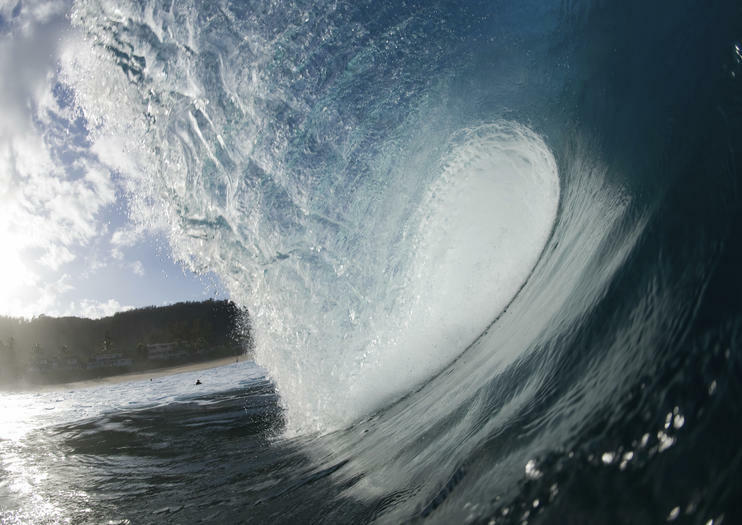 Experts try their luck when Pipeline pounds between October and April with waves heights averaging 15 feet. As one might imagine, with surf crashing close to shore, Pipeline is a sight to behold even for landlubbers. Gawkers come out in droves to see the spectacular sunsets over the tropical waves, but especially to see the pros shred it. The Billabong Pipe Masters’ challenge—the final competition in the World Surf League’s competitive season and culminating event of the Vans Triple Crown of Surfing—selects its winner here each December. In the summer months, it can be hard to recognize The Pipe. The ocean pulls a 180, the wind and the waves die down and the waters off Banzai Beach become a popular snorkeling spot. In typical North Shore low-key style, no signs blare “Pipeline this way.” If you weren’t looking for this world famous spot, you might miss it! The break is located off Ehukai Beach Park in Pupukea, and most easily found by spotting Sunset Beach Elementary across the street. If you have a GPS, set it for the Beach Park at 59-337 Ke Nui Road. A small parking area fits maybe 20 cars, and when the waves are good it’s almost always full. Your best bet will likely be to park on the left side of Kamehameha Highway and walk back. Note even in the summer waves and currents can be finicky: If you plan to snorkel, check with lifeguard (daily 9 a.m. til 5:30 p.m.) to make sure it’s safe to proceed. Explore Oahu's landscape and history during this full-day guided sightseeing tour from Waikiki. Discover the island's beauty through visits to Halona Blowhole, Hanauma Bay and the surfer's beaches on the North Shore. Stop at historic sites like the USS Arizona Memorial at Pearl Harbor and Nu'uanu Pali while your guide shares engaging, informative commentary about the natural resources, history and culture of Oahu. This comprehensive tour is perfect for those who only have a short time to spend on the island. Spend the afternoon and evening exploring the Oahu coastline on this countryside tour from Waikiki that takes you to off-the-beaten path locations such as lookout points, temples, banyan trees, fishponds, and, lastly, the island's North Shore, where you'll capture photos of the sunset. The route includes Mount Tantalus for a view of Oahu's southern coast, stretching from Pearl Harbor to Diamond Head. Soar into the sunset on a 4-passenger helicopter flight over Oahu’s North Shore. This 30- to 40-minute aerial tour includes the option to fly with or without doors. Listen to informative commentary by a licensed pilot who points out the Ko‘olau Mountains, Haleiwa town and remote Ka'ena Point. Ready for an adrenaline rush? Upgrade to the doors-off option!